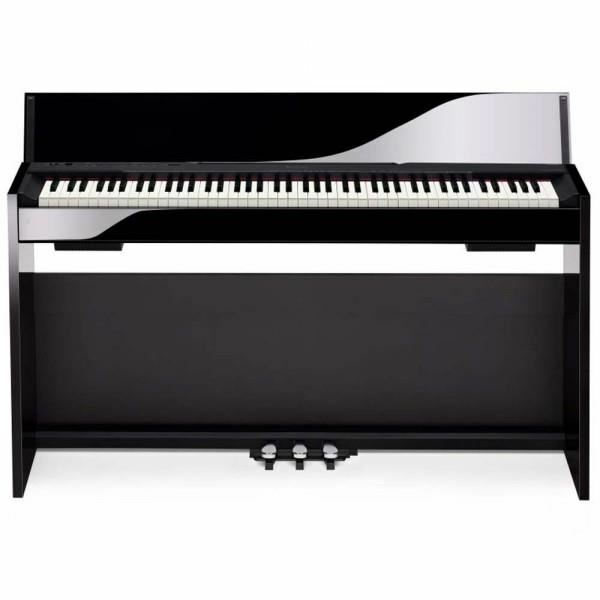 The Casio PX830 BK Privia Digital Piano is focused on pure piano playing. That starts with the refined matt keys (ivory touch) with a pleasing playing action. The hammer and repeating action on the keys is just as luxurious as the 128-tone AiF sound source with Linear Morphing for dynamic sound behavior. The minimalist design provides a perfect counterpoint to the extraordinary wealth of sound. The “Black Polish” variant provides the PX-830 with an especially refined look. The new Casio Privia PX-830 creates a new digital piano category with unprecedented sound quality and performance in an exquisite new cabinet. Featuring all new grand piano samples, a new “Ivory Touch” Tri-Sensor 88-note scaled hammer action keyboard, the dynamic sound and appearance of the Casio Privia PX-830 will make a perfect addition to any home. The grand piano sounds in the PX-830 delivers an unprecedented level of realism and expression. Four dynamic layers of stereo piano samples are integrated with Casio’s proprietary Linear Morphing System, resulting in a grand piano sound with seamless transitions and a superior dynamic range. For added realism, the PX-830 simulates the sound of the open strings when the dampers are raised by the pedal using Acoustic Resonance DSP. The PX-830 also has 128-note polyphony, enough horsepower for the most demanding musical passages and the ability to layer sounds and use the damper pedal without worry of dropped notes. Reinforced by a new dual 20W speaker system, the result is a grand piano experience that is unmatched at any price. The Privia PX-830 features a new “Ivory Touch” Tri-Sensor 88-note scaled hammer action keyboard. Casio’s superior engineering has resulted in an authentic piano touch that captures every detail and nuance of your performance. The matte finished keys and scaled hammer action provides the weight, feel and resistance of an acoustic grand piano. Available in either black matte or black polish, the PX-830’s cabinet captures the enduring aesthetic beauty of an acoustic piano in a slim, elegant design that is the hallmark of the Privia line. The flagship of the new Privia line, the PX-830 has the advanced AiR sound set providing an additional level of realism, including grand piano lid simulation and sympathetic resonance. A combination of a new keyboard action and a powerful new sound engine provide a new level of detail, nuance and expression for a superior grand piano experience in the stylish design that Privia is known for. The award winning grand piano sound in Privia has been dramatically improved. The PX-830 utilizes more than three times the memory of the previous generation for a more natural piano tone. In addition, Casio's new proprietary sound source "AiR" (Acoustic and intelligent Resonator) provides unmatched realism and detail. This engine provides seamless dynamics for a remarkably expressive and powerful performance. For further realism a new Damper & String Resonance and Hammer Response simulator provides the rich sound of the strings when the sustain pedal is used. The PX-830 also features a new redesigned 88 note Tri-sensor scaled hammer action keyboard. This new action features new simulated Ebony and Ivory textured keys for an incredible feel and it's three sensors capture the dynamics of a performance with unparalleled speed and accuracy. To further enhance the experience, the action and the sound engine take into consideration the speed at which different sized hammers move inside acoustic grand relative to velocity the keys are pressed, this timing nuance provides the ultimate key to sound experience. The PX-830 offers an impressive 256 notes of polyphony, as well as a choice of instrument tones including strings, organs, electric pianos and bass. The PX-850 provides split and layer capability allowing you to play bass in your left hand and have two layered tones in your right. Duet mode splits the keyboard into two equal ranges, allowing student and teacher to use the piano simultaneously. An easy to use USB port and built in two track recorder can record and playback your practice and performances. A 20W + 20W amplifier provides incredible sound and an adjustable top lid can create the resonance of a grand piano with the lid completely open, partially open, closed or removed. The matching keyboard cover, stand and pedal board make this a complete digital piano that is a welcome addition to any home dècor.